Way back in 2010 was when news first surfaced of the film Grudge Match. Tommy Boy and 50 First Dates director Peter Segal is behind the camera for the film, and we couldn't believe that Sylvester Stallone (Rocky) and Robert De Niro (Raging Bull) were in the running to play two bitter boxing rivals who are coaxed back into the ring for a grudge match 50 years after they fought for the title. But the actors were confirmed last summer, the film was greenlit last fall, and now the comedy is coming on Christmas Day this year. A first look photo has surfaced with our leads annoyed with fight promoter Kevin Hart. Look below! Grudge Match is directed by Peter Segal (Tommy Boy, My Fellow Americans, 50 First Dates) with a script from "Entourage" creator Doug Ellin and "Late Show with David Letterman" scribe Rodney Rothman. 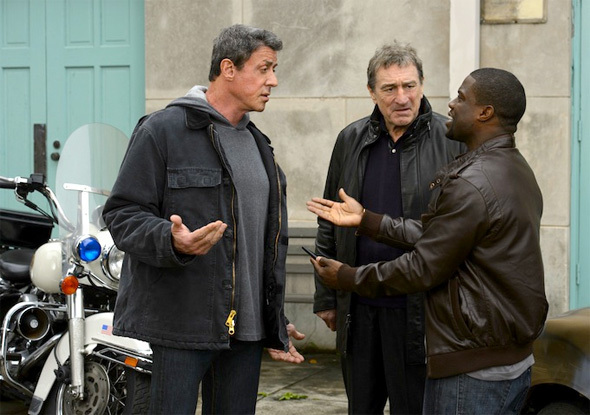 The story unites Sylvester Stallone and Robert De Niro, known for iconic turns as boxers in Rocky and Raging Bull respectively, as two bitter boxing rivals who are coaxed back into the ring for a grudge match 50 years after they fought for the title. Kevin Hart, Alan Arkin, Kim Basinger and Jon Bernthal also star in the film which Warner Bros. Pictures will bring to theaters on Christmas Day, December 25th, this winter. Cool? Thought this was a rumor? Great to know this is gonna be out this year!